Planting Dates: For spring, plant seed 4-6 weeks before the last average frost. 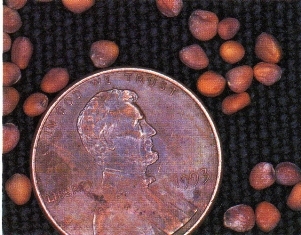 For fall, plant seed 6-8 weeks before first average frost. They grow so fast, they can almost be planted any time. In general, January 20 - April 30 and September 1 - November 15. Planting Method: Seed only. Broadcast or plant in rows ½ inch deep. Use 3-4 seeds per inch and then thin the stand about 3-4 days after emergence. Seed Emergence: Radishes germinate quickly. Usually 3-7 days at 45-90°. About 85° is ideal. Harvest Time: 20-35 days after planting. Some of the winter types take longer. Growth Habits: Very fast growing annual vegetable. 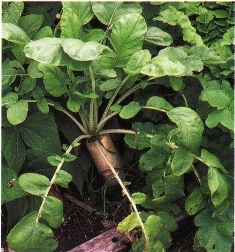 The swollen root of the plant is the edible part. Culture: Radishes like cool soil and need moderate amounts of water and fertilizer. Radishes can be grown in any healthy soil, in garden beds, or in containers. Fertilize with an organic product about two weeks after emergence. Troubles and Solutions: Control slugs, snails, and cutworms with hot pepper products, diatomaceous earth, cedar flakes, and garlic-pepper-seaweed spray. Wireworms and nematodes can be controlled with citrus pulp tilled into the seedbed prior to planting the seed. Failure to bulb can be solved by thinning the crowded seedlings. Radishes become pithy if left in the soil after maturity. Flea beetles and aphids can be controlled with other citrus sprays or sugar followed by the release of lady beetles. Harvest and Storage: It is best to eat radishes soon after harvesting. Store them if needed in the refrigerator. An ice bath prior to storing helps. Notes: Radishes are the fastest of all the edible plants to grow and an excellent choice to get children started in gardening. They are also used as companion plants with summer vegetables to help control troublesome insects. Varieties: ‘Gala’, ‘Red Ball’, ‘Easy Red’, ‘French Breakfast’, ‘White Icicle’, ‘Red Prince’, ‘Champion’, ‘Snow Belle’, ‘Black Spanish’, ‘Cherry Belle’, ‘Crimson Giant’, ‘White Round’, ‘Easter Egg’, ‘Plum Purple’, and many others. Toning down hotness in vegetables. the refrigerator. The next day, the strong taste is gone, and they are a nice crispy addition to salads.